The market dipped but it did not drop after the Brexit vote. U.K. Prime Minister Theresa May suffered the largest defeat in U.K. political history with a 432 to 202 vote loss. That 230-point loss could have signaled the end of her time as Prime Minister. With the U.K. set to leave the EU on March 29th, time is running out to agree on a plan for the divorce. The parliament has three days to come up with a plan of action. May is going to televise a "Plan B" option this week. The challenge is that any plan must be approved by the EU and they are playing hardball and realize the U.K. is running out of time. By not negotiating they are hoping to get a better deal for the EU. There are basically only a few options left. The first is a vote of no confidence against May and that should happen on Wednesday. If the vote passes the current parliament would have 14 days to come up with a new government but that does not change the deadline on the EU exit. It just complicates the remaining negotiations. They could force a new general election in an attempt to change the party in power. Still no change in the exit date. They could try to renegotiate but the EU realizes the government in in disarray and that is not likely to work. They could ask for an Article 50 extension to put off the exit date by some period of time while the U.K. works through its political problems. There could also be a "hard Brexit" with no deal and that is the worst-case scenario for both the U.K. and the EU because trade could come to a screeching halt with no agreement on borders, etc. Lastly, there could be another referendum on the entire Brexit process. The initial referendum barely passed and after two years of constant argument about the exit many citizens are ready to throw up their hands and forget it. Many voters did not even understand what a Brexit would mean when the original vote was held. Everyone would be far more aware this time. Despite the positive close it was a very volatile day. The market opened strongly positive but comments from Senator Chuck Grassley at 10:00 knocked off 140 points in just a couple minutes. He said trade representative Lighthizer told him he did not see any significant progress being made in the China trade talks. That knocked the market back into negative territory. The Dow eventually recovered and rose back to +188 before fading into the Brexit vote at 2:PM. The initial headline produced a minor spike then another big drop back to zero. 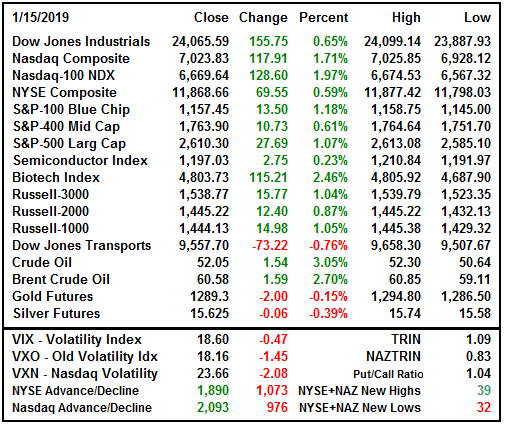 The rebound into the close was the most bullish move of the day because it represented investors buying bad news and lifting the indexes back over current resistance. The market started the morning with positive news for the Fed. The Producer Price Index for December declined -0.2% after a +0.1% rise in November. The cost of goods declined -0.4% and services fell -0.1%. Intermediate goods fell -0.9% and core processed goods fell -0.7%. What all that means is that inflation at the producer level is declining thanks mostly to a -5.4% decline in energy prices. The PPI for gasoline fell -13.1%. Core goods, excluding food and energy, rose only 0.1%. Prices for airline tickets, cell phones, electronics, internet services, etc, all declined. On a trailing 12-month basis the PPI is up 2.4% but that represents a continuous decline from the peak at 3.3% in July. Inflation is fading and the Fed is likely to remain on hold for a while. In an interview today, former Fed Chair Janet Yellen said she expected interest rates to remain low for a "long time" and that was music to investor's ears. Also surprising is that tariffs on imported goods and materials have not raised prices on those finished goods. Since the administration is not likely to raise tariffs on China at the end of February as previously threatened, there are no obvious price hikes on the horizon. If tariffs are cancelled, prices will decline further. This is good news for the US consumer. The NY Empire Manufacturing Survey for January fell sharply for the second month. The headline number declined from 10.9 to 3.9 after peaking at 24.3 in August. This is the lowest reading since mid-2017 and the third lowest reading in seven years. The new orders component fell from 13.4 to 3.5, inventories from 7.1 to -7.6 and employment from 17.5 to 7.4. Backorders declined from -5.1 to -7.6 and the fourth consecutive month without a gain. Analysts believe the trade war with China, impending recession in Europe and the government shutdown all impacted sentiment and soured sentiment for manufacturers. 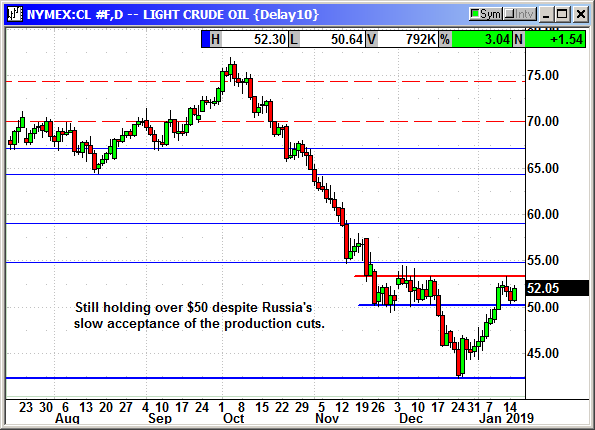 After the bell the weekly API inventory report showed only a minor 560,000 barrel decline in crude inventories. For the third week inventories of refined products rose sharply. Gasoline inventories rose by 6.0 million barrels and distillates by 3.2 million barrels. Crude prices declined only 10-cents in afterhours. 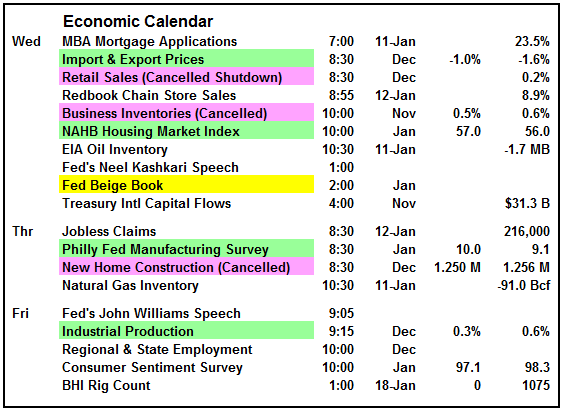 Our economic calendar is shrinking as government reports are being cancelled by the shutdown. There may be more, but these are the ones I know for sure. The Beige Book is still on tap and given the recent weakness in the regional reports, this summary of all the Fed districts could be a challenge if it shows similar weakness. The Philly Fed Survey on Thursday is expected to post a gain, but it would be an outlier compared to some of the other regional reports. The headliner for the earnings on Wednesday is Goldman Sachs. They are facing a fine of up to $7 billion for their part in the Malaysian investment fund scandal. Their earnings and guidance will be critical. Bank of America is expected to follow the model set by JP Morgan with positive earnings but weak revenue because of the lack of trading volume in December. Netflix is the big dog on Thursday and subscriber growth is more important than earnings. Q4 is normally a big quarter so expectations are high. While on the topic of Netflix, the company announced another round of price increases this morning for their 58 million subscribers in North America. Prices will rise from 13% to 18% and the largest increase in their history. The price change will raise an additional $1.4 billion a year in revenue and help offset the expected $3 billion cash burn in 2019. The cheapest plan will rise from $7.99 to $8.99. The HD standard plan will rise from $10.99 to $12.99 and the premium 4K plan will rise from $13.99 to $15.99. The prices will take effect immediately for new customers and existing customers will see the increase hit their bills over the next three months. Some Latin American countries will also see higher rates. International customers will not be impacted. Last quarter Netflix saw subscriber growth rise 10.7% to 58 million domestic and 78 million international customers. 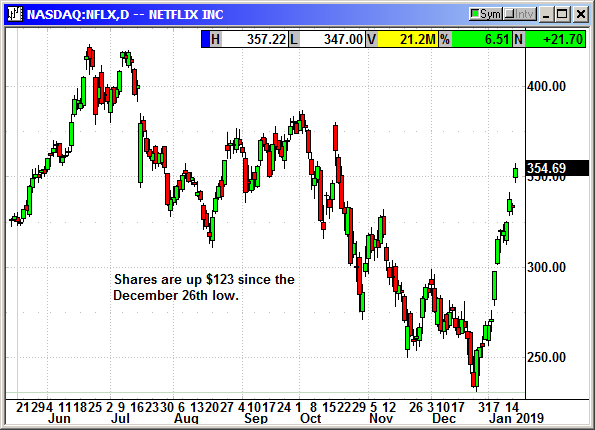 Netflix also saw an upgrade from Goldman Sachs who thinks the share price is still 20% undervalued. That means it is only 14% undervalued tonight according to their projections because the stock gained 6% today. 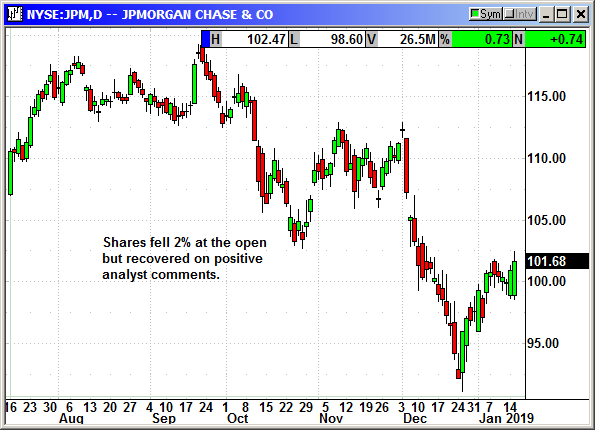 Shares of JP Morgan (JPM) fell nearly 2% at the open after missing estimates. Earnings of $1.98 per share missed estimates for $2.20. Revenue of $26.80 billion missed estimates for $26.84 billion. Loans rose 6%, credit card volumes 10% and net interest margin rose 10%. However, trading volume crashed in December as investors fled the market early and avoided the late December crash. Algo computers and institutional tax loss selling provided the majority of late December volume and JPM does not get any revenue from them. This was the first time in 15 quarters that JPM has missed on earnings. Shares rebounded later in the day after numerous analysts called this a buying opportunity and the low trading volume an abnormal situation. Shares closed at a 4-week high. 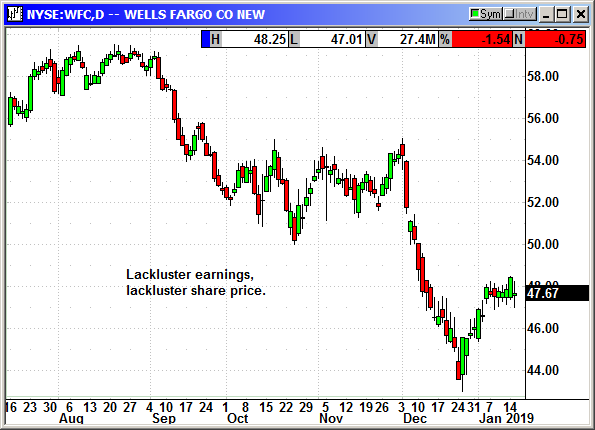 Wells Fargo (WFC) reported earnings of $1.21 and beat estimates for $1.16. However, revenue of $20.98 billion missed estimates for $21.73 billion. The bank is currently working through a restructuring program to eliminate 10% of its workforce. It continues to be under pressure for past sins and the Fed rejected the bank's plan to prevent future abuses. The bank is operating under a Fed imposed cap on asset growth until it can produce and implement a new control structure. Consumer and small business banking revenue fell 2% to $11.5 billion. They saw a decline in mortgage growth and the drop in small business banking was due to the sale of branches to reduce expenses. Revenue from "banking and other services" fell 7% to $514 million also due to the sale of some businesses. Wealth management revenue fell 9% to $3.9 billion. Problem loans declined 9%. The CEO made all the stock TV talk shows trying to downplay the earnings and emphasize future growth, but the share price declined slightly. WFC is still a bank in trouble and it could be several more quarters before the cloud is lifted. 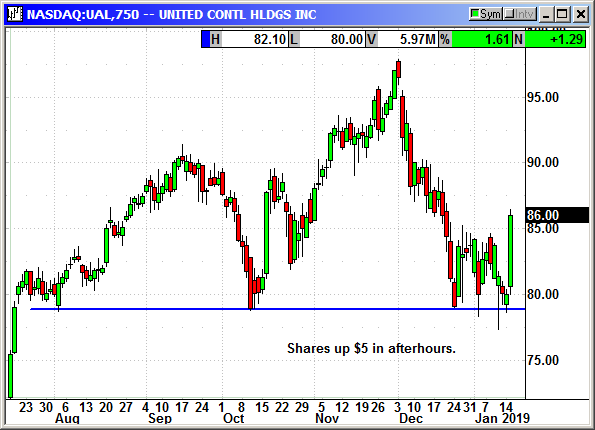 UnitedHealth (UNH) reported earnings of $3.28 that beat estimates for $3.20. Revenue of $58.42 billion rose 12.28% beating estimates for $57.93 billion. Traditional insurance subscribers rose 11% and the Optum health-services unit saw revenue rise 13%. Optum revenue broke over $100 billion for the first time in 2018. Shares dipped slightly at the open before recovering to surge to a $8.81 gain. 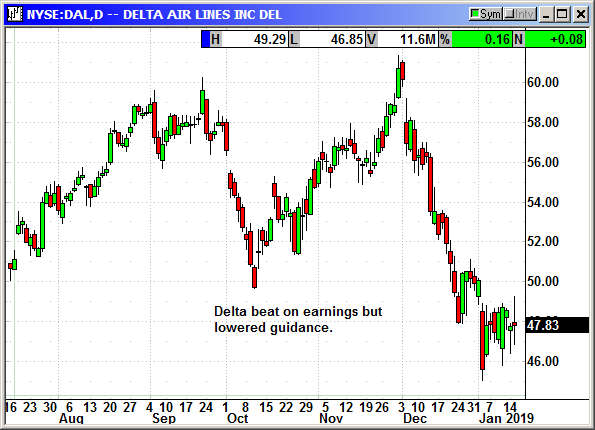 Delta (DAL) reported earnings of $1.30 that beat estimates for $1.27. Revenue of $10.74 billion rose 5% and roughly matched analyst estimates. Revenue per passenger mile rose 3.2% and slightly above the 3.0% estimates. The company said it was likely to decline to 2.0% in Q1 because of high comps from last year and the Easter calendar shuffle. The airline will lose $25 million in January as a result of the government shutdown. They guided for Q1 earnings of 70-90 cents and below analyst estimates for 94 cents. However, for the full year they expect earnings to rise to $6-$7 because of lower fuel prices and other expenses and thanks to higher ticket prices. Shares were volatile after the report but closed flat. After the bell, United Airlines (UAL) reported a monster quarter with earnings of $2.41 compared to estimates for $2.01 per share. Revenue rose from $9.5 to $10.5 billion (+11%) and beat estimates for $10.3 billion. Revenue per passenger mile rose 5%. Strangely, their fuel bill in a quarter of rapidly falling oil prices, rose 27%. They do expect it to decline in Q1. They guided for Q1 for earnings of $1 that topped estimates for 84 cents. Shares posted a $5 gain in afterhours. 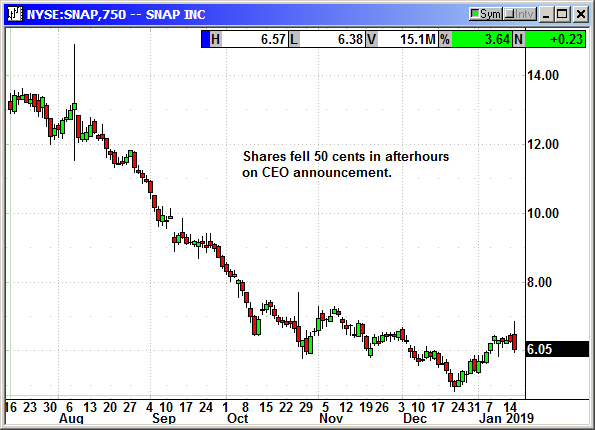 After the bell the Snap Inc (SNAP) CFO, Tim Stone, said he was leaving the company to pursue other opportunities. There has not been a date set for his departure and he will remain until after the earnings in February. He has held the position for less than a year after being hired away from Amazon. I am sure the culture shock was too much to bear. Snap has had a steady string of executive departures over the last year. Shares fell 50 cents in afterhours. 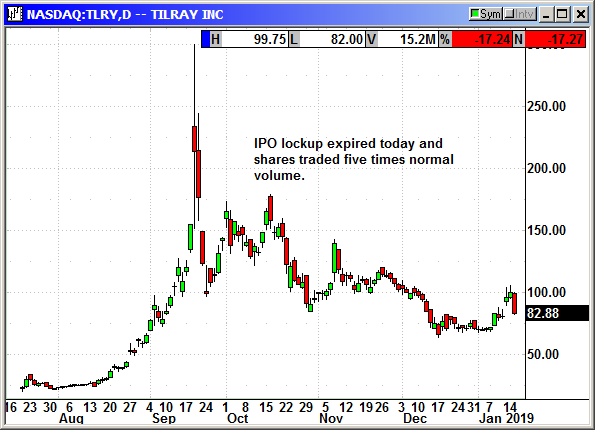 Cannabis company Tilray (TLRY) saw its shares fall 17% as the IPO lockup expiration expired. The sell off could have been worse. Privateer Holdings owns 76% of the company and they had already said they would not sell any shares in the first half of 2019. Insiders own another 11% and they were not expected to sell. Volume today of 15.3 million shares was more than five times the average volume. There are 78 million shares outstanding. The company also announced an agreement with Authentic Brands Group (ABG) to market and distribute cannabis products. ABG has multiple brands available. Tilray will be the preferred supplier of cannabinoids and will have rights to up to 49% of revenue from the cannabis infused products in exchange for a $100 million payment and up to $250 million in stock. 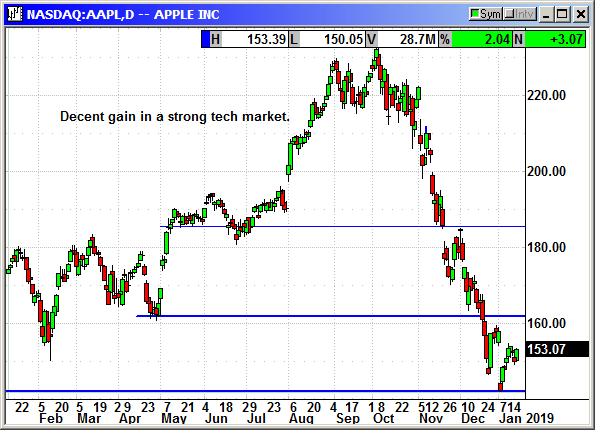 Apple (AAPL) shares rallied after a German court tossed a new patent case brought by Qualcomm in Germany. This has no impact on the earlier case that imposed a ban on certain iPhones. Many investors probably read the headline and raced into the stock. Qualcomm is going to appeal this particular case. After the bell, Apple announced the availability of an iPhone Smart Case for the XS, XR and XS Max. These are $129 each and adds up to 20 plus hours of phone usage without charging but it does make the phone thicker. The battery cases come in black or white and also operate with a wireless charger. This is the first time Apple has offered this accessory since the model 6. Apple reportedly replaced about 11 million iPhone batteries during the length of its battery replacement program. Cook initially expected to replace only 1-2 million. The replacement offer cost $29 and came after it was learned that Apple was turning down phones to a lower performance level as batteries aged. This slower performance led users to upgrade more often. In Apple's recent earnings warning Tim Cook said the extra expense of the battery replacement would drag on earnings in Q4 as users raced to get new batteries before the December 31st expiration date. Walmart (WMT) is likely to leave the CVS family because of an ongoing pricing dispute. Walmart has 4,600 locations with CVS pharmacies. Anyone with a CVS-administered drug benefits program like Medicaid enrollees with CVS drug coverage will not be eligible for discounts at Walmart. The company said they were disappointed CVS chose not to resolve the ongoing dispute in a way that would be beneficial to both our customers. 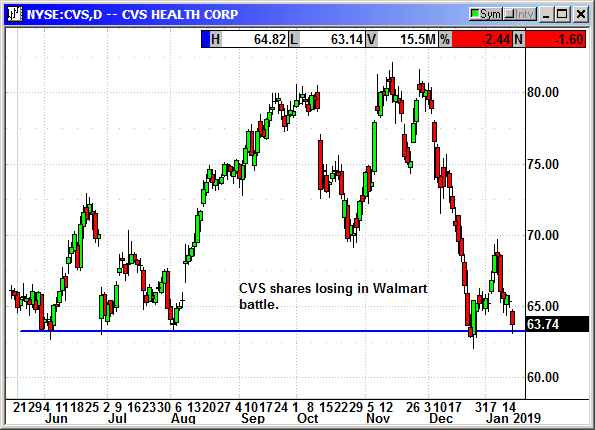 CVS said Walmart accounts for only 5% of the volume in the CVS system and the change would not impact CVS results. The challenge is that Walmart wants to pass the drug savings on to the consumer rather than pay it out to a middleman in the network. The split will not occur until April 30th. Walmart said it was still trying to come up with a satisfactory solution. 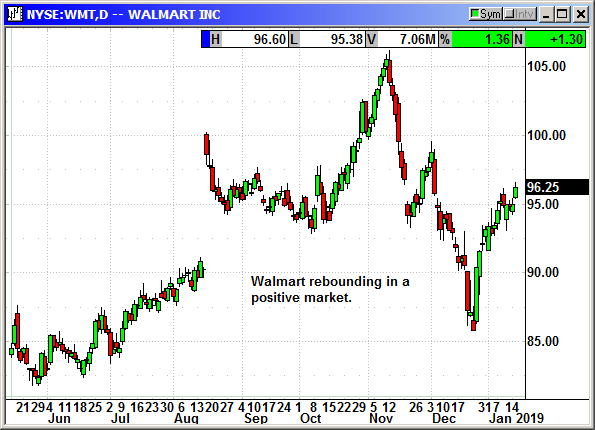 Walmart shares rose $1.30 and CVS shares declined $1.60. This was a good day. Bad news was bought, and short-term resistance was broken. That is a recipe for continued gains. The S&P closed well above resistance at 2,600 and should now be targeting the 50-day at 2,631 and the 10% correction level at 2,637. On the way down that 10% level provided multiple rebounds and now we get to face that same level as resistance on the way back up. 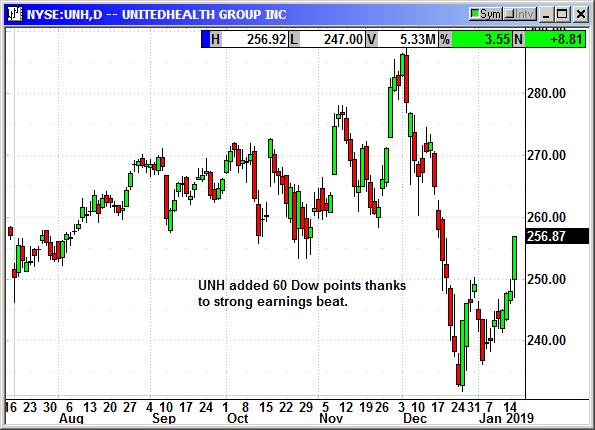 Tech stocks helped UnitedHealth lift the Dow and it was a good day. 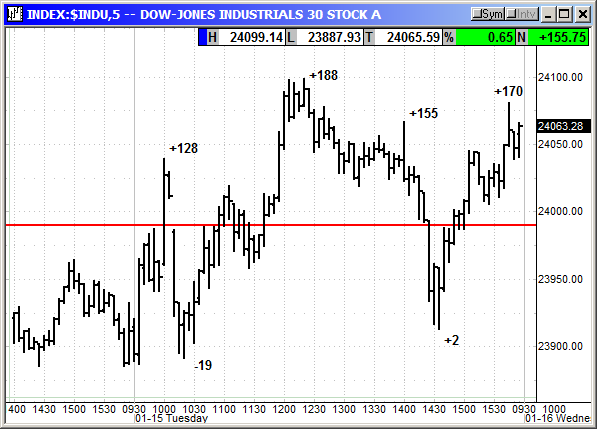 The index closed well over round number resistance at 24,000 and is now targeting the 10% correction level at 24,145. After that we will be in the midst of some heavy congestive resistance from the volatility in November that begins at 24,275. This is not going to be an easy rally. 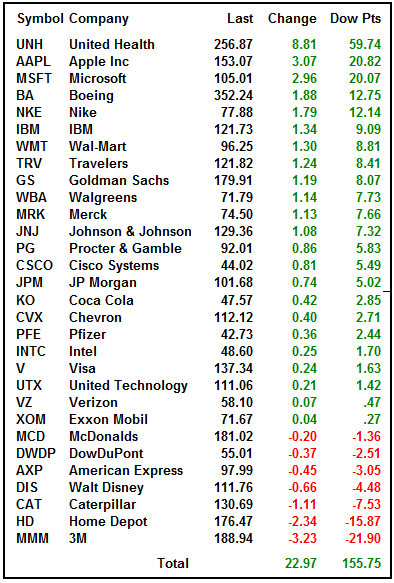 With many Dow components to report over the next two weeks there will be volatility from earnings misses. 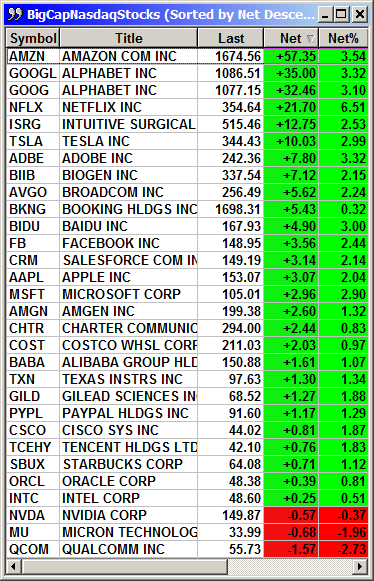 The FAANG stocks were market drivers on the Nasdaq thanks to Netflix leading them higher. Even Facebook added $3.50 but could not hold a candle to the top four in this list. Those were some monster gains powering the index higher. 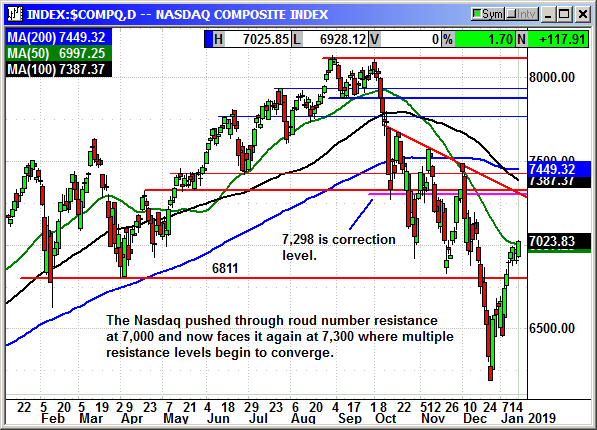 The Nasdaq closed over the 50-day at 6,997 and the round number resistance at 7,000. 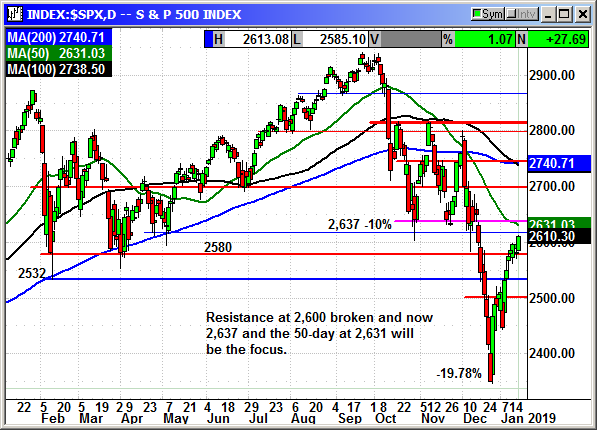 The next hurdle is 7,300 and downtrend resistance followed by the 100/200-day averages. The tech sector should continue to lead. Investors love to buy techs stocks in a market rally because it has worked for them so many times before. 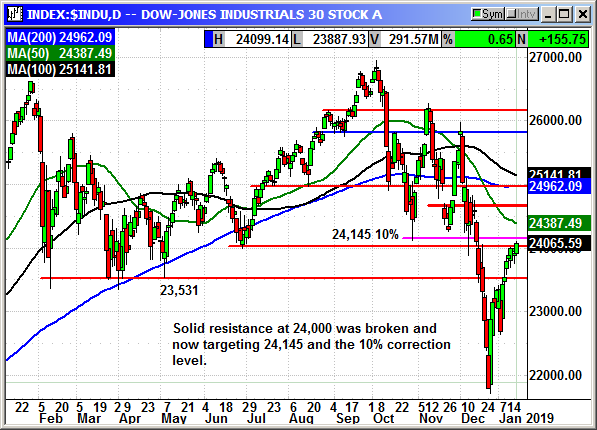 The correction level resistance is only 2 points below 7,300 making that level very important. 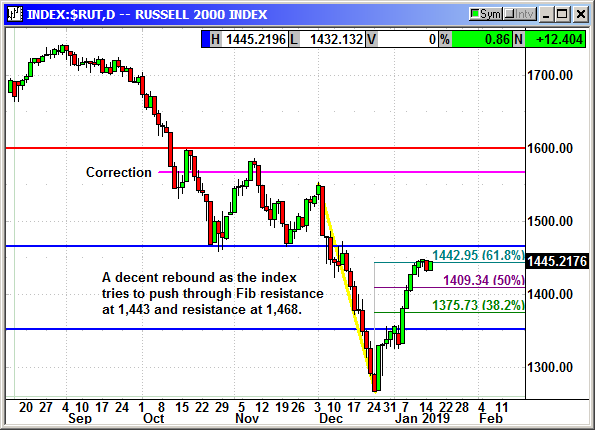 The Russell recovered all by 2 points of Monday's decline, but it cannot seem to push through the Fib resistance and 50-day around 1,446. 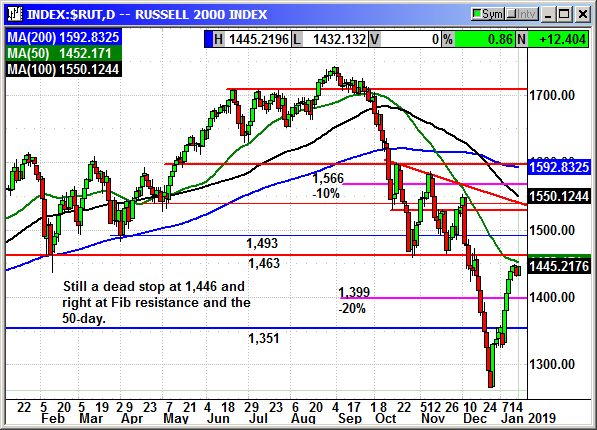 We need the Russell to snap out of its funk and lead the markets higher. I believe the markets are going higher, but it may be a rocky road. The earnings are turning into mix of good and bad and hopefully we will get more good and less bad. The challenge is that one bad apple can spoil a lot of good ones. I would continue to buy the dip since that is what is working. We have seen morning dips the last four days with higher levels in the afternoon. 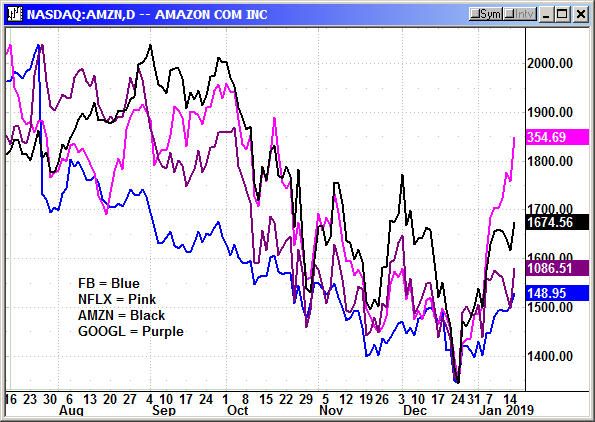 This is a critical week for market sentiment leading into the tech reports next week. The three-day pause appears to be over after markets rallied despite bad news. The challenge here is the multitude of watched pots that could boil over with negative headlines at any time. Hopefully earnings will continue to be the focus and the economic, trade and political issues will be ignored. 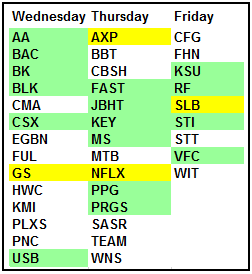 Another positive day on Wednesday could set the stage for a new leg higher.